Everyone reacts differently to stress, depression, grief, and anxiety. Some of the causes and effects of these problems result from things completely unrelated to type. But there are some telltale signs you can look out for in yourself and others to find out if someone’s really struggling. If you’re looking for ways to help those who are grieving, check out the second part to this article here. And Don’t Forget: These descriptions are basic templates, but every single individual will vary in how they handle and respond to grief. These are the statistics, what’s “normal”, but not everyone fits their statistic, and not every INFP/ISTJ/ENTJ/ESTP is the same. So take all of this with the realization that there will be variations depending on unique individual traits. ISTJs experiencing grief can get stuck in a “loop” of re-playing what went wrong and how they could have done things differently or better. They tend to blame themselves first when things go wrong, rather than looking outside themselves. They can have difficulty assessing their own emotions, sorting through how they feel, or taking the time to understand it. When their emotions do hit them, often completely out of the blue, they tend to feel powerless and out of control. This feeling of being out of control is unnerving for them, even terrifying sometimes, especially because ISTJs are such strong believers in controlling their impulses and emotions. On the outside they tend to present a calm face even if inside they are experiencing deep inner turmoil. They try to step back and apply detached logic to the situation, sometimes even choosing to “cut loose” and move on from their grief as quickly as possible, but this can result in repressed emotions, anger, and despair that “bubbles up” later. In cases of chronic despair or stress, ISTJs can get stuck in a phase of “catastrophizing”. They may see nothing but negative possibilities and things that could go wrong. They may try to brainstorm solutions, but see nothing that looks promising. You can find out more about this stage, and what helps them here. ISFJs experiencing grief can get stuck in a cycle of re-playing what went wrong and what they could have done differently or better. They tend to blame themselves before looking outward at the other effects and facts involved. They often get stuck dwelling on negative emotions as well as experiencing the pain of other people affected by whatever happened. They can find it very difficult to see beyond the immediate personal turmoil they are experiencing. They tend to be supportive and good listeners to other people who are also grieving. They will usually try to find practical ways to help or provide emotional support. Often they are helped by “venting” their emotions or getting support from a counselor or trusted friend. They are less likely than thinking types to avoid dealing with the emotions and only have them “bubble up” later. In cases of chronic despair or stress, ISFJs can get stuck in a “catastrophizing” phase. In this phase they see nothing but what could go wrong, and they may fixate on brainstorming, only to find negative possibilities and outcomes for the future. You can find out more about this stage and what helps them here. ESTJs experiencing grief try to present an active, competent face to the world. They don’t want the world to know what they are feeling and it can be easy for other’s to miss signs of their distress. It is common for them to look outwards to find blame before looking inwards; and if confronted during a particularly stressful time, they may seem bitter or irritated by it rather than encouraged. They’ll try to apply detached logic to the situation, take charge of things, or else move on completely and quickly. ESTJs tend to struggle with accessing their own emotions when they are grieving. They may try to “stay busy” and fix things and take care of practical matters rather than resolve their own emotions. This can cause emotions to show up later in unhealthy or out-of-control ways. They can also become impatient or uncomfortable with other people experiencing grief in a more emotional way. This forces them to look their own despair in the face. When they do experience their own emotions, they tend to feel out-of-control and powerless. in cases of chronic despair or stress, ESTJs can get stuck feeling that everyone is against them or that they are without support. They feel like they have to be “the responsible one” or “the calm one” and this can make them resentful of others or depressed. You can find out more about this stage and what helps them here. ESFJs experiencing grief tend to try to appear active and competent, regardless of how much pain they are feeling inside. This may cause others to underestimate their distress. They may become fixated on “fixing” things, cleaning house, taking meals to people, and solving practical matters. They may assume that their loved ones should just know how they feel without having to explicitly state how they feel. This can cause frustration if they don’t get the comfort and empathy that they need from people. It can be difficult for them to say, “I need to talk right now”, or “I am feeling sad, can we sit together”. Once support is given by someone, they will usually seek support more freely and express their emotions readily. They are also good at helping other people express their emotions, providing a listening ear an affection to those who are struggling. They are very in tune with the emotional experiences of others, so this can cause them to get “stuck” not only in their own grief, but the grief others are experiencing. They may overdo being supportive, and feel overbearing to types who prefer more space and independence. In cases of chronic of despair or stress, ESFJs can get stuck in a “criticizer” mode. They may become excessively self-critical, finding fault with everything they do. They may see nothing but flaws, mostly in themselves, but also in others. They may search endlessly for a logical “fix” for their despair. They usually experience very low self-esteem at this time. You can find out more about this stage, and what helps them here. ISTPs experiencing grief tend to appear one of two ways: Either they are extremely reserved and stoic, keeping to themselves and trying to “move on” from the problem as quickly as possible, or they do the opposite and become uncharacteristically emotional and angry. Some ISTPs fluctuate between the two extremes. They are usually not anxious to seek people out to talk things over. They usually look inwards and tend to blame themselves before placing blame on others. ISTPs are good at stepping back and applying detached logic to whatever situation is causing them grief. They can problem-solve and find practical solutions to try to prevent the same situation repeating itself. But they can struggle with accessing their own emotions, giving themselves time to grieve, and in turn, become overwhelmed by their unprocessed emotions. ISTPs who are experiencing chronic despair or stress tend to become uncharacteristically emotional. They are likely to have angry outbursts or lose their characteristic level-headed, logical nature. This is very upsetting for them because it’s so unnatural to how they normally behave. You can find out more about this stage and what helps them here. ISFPs experiencing grief tend to feel emotionally exhausted and trapped. Some feel intense emotions and anger and show it, while others do the exact opposite and hide everything they are feeling from others. They tend to look inside first to try to figure out what they could have done wrong or if there was any moral failure on their part. They aren’t quick to cast blame on outside sources. Many ISFPs feel a loss of energy and a feeling of burnout and depersonalization. They can get stuck sleeping a lot or watching a lot of TV to try to preserve their energy or decrease their stress levels. They won’t usually open up emotionally to someone unless a great deal of trust has already been established. It is helpful for them to have plenty of time to process their emotions. ISFPs who are experiencing chronic despair or stress can become uncharacteristically critical and sarcastic. They may become obsessed with fixing problems or “righting” wrongs, or they may turn their criticism inwards and evaluate all the ways they believe they have failed. You can find out more about this stage and get tips for overcoming it here. ESTPs experiencing grief tend to appear calm, practical, and in control. It can be difficult for other people to identify the turmoil they are feeling inside, and it can be hard for them to even take time to process it. ESTPs are the kind of people who are strong believers in “picking themselves up by their bootstraps” and moving on, so adequately processing emotions isn’t something they give priority to. They tend to avoid asking for help if they need it, and may experience sudden bursts of emotion or anger that are confusing to them because they spend so little time introspecting about their own feelings. If despair or stress is chronic, ESTPs may fall into a state of “doom and gloom”. They may see only one negative possibility for the future and lose their signature optimism and resourcefulness. Everything can seem bleak and ominous when they are in this stage. You can find out more about this stage and get tips for overcoming it here. ESFPs tend to look outside of themselves first when they experience grief. They will try to figure out where the problem started, where the blame lies, and what the facts were. Then they will introspect to see how they feel about what’s going on and process their emotions. After a brief respite of solitude they usually want to find someone to talk to and confide in. They benefit tremendously from expressing their emotions to someone else and seeking support. According to the MBTI® Manual, ESFPs are one of the most likely types to “get angry and show it” during times of high stress. They can get stuck in negative emotions or find it difficult to see beyond the immediate turmoil they are experiencing. One of the positive qualities of ESFPs is that they are usually good at looking around and offering support to others who are also grieving. The more support they can find from their loved ones, and the more time they give themselves to process their emotions, the better. If despair or stress is chronic, ESFPs may fall into a state of disillusionment. During these stages they tend to feel that the future holds nothing but one negative scenario, and they can lose their signature optimism and resourcefulness. You can find out more about this stage and get tips for overcoming it here. When experiencing grief, INTJs tend to look inwards first. They often want to detach from the world and get away to process things on their own. They can have difficulty processing the emotions they are dealing with, and may find themselves trying to apply logic to the situation so they can move on. They often become impatient with themselves and overwhelmed if they aren’t given time or space. If they have to be around other people they will try to present a calm face. They usually don’t want other people to know about their emotional struggles and grief unless there is a considerable amount of trust built up. Some INTJs find themselves increasingly drawn to sleep or exercise as a way to deal with it. If despair or stress is chronic, INTJs may fall into a state of indulgence or hyper-sensory awareness. They can become uncharacteristically obsessed with details or prone to binge-eating/drinking or over-exercising or anything sensory and impulsive. You can find out more about this phase, and how to help here. When INFJs experience grief, they will initially look inwards to try to process what happened privately. Unfortunately this means that they often blame themselves for things that might have been caused by an outer source. They will usually withdraw from people for a while, processing the emotions, trying to understand the implications of what happened and the meaning of it all. Over time they will seek support if they have a trusted confidante, but if there’s nobody they are especially close to they will usually keep quiet. They are concerned with how other people are handling grief as well, and will seek to support other people in their emotions. They can get stuck experiencing everyone else’s pain and lose sight of processing their own feelings. They can also overdo being supportive and forget to take care of themselves. If despair or stress is chronic, INFJs may fall into a state of over-indulgence or hyper-sensory awareness. This takes on different forms for different INFJs. Some will over-eat, some drink too much, some exercise or clean excessively. The over-arching theme, however, is that they get stuck doing impulsive, indulgent activities or obsessing over details. You can find out more about this phase (and what helps) here. When ENTJs experience grief, they tend to appear much calmer on the outside than they really feel inside. They try to present a composed, “in control” face to the world while inside the turmoil they feel is usually very overwhelming. To handle their suppressed feelings, they may try to problem-solve, take charge, or “fix” things in their outer world. They often try to apply logic to the situation and inevitably feel betrayed when this doesn’t work. They can become impatient with their own emotions and the emotions of people around them. They may suddenly find themselves crying or upset out of nowhere, and have difficulty even knowing why they’re crying because they’ve suppressed their emotions for so long. If despair or stress is chronic, ENTJs may fall into an uncharacteristically emotional, introspective state. They can become very withdrawn from people and lose sight of their normal “in-charge, always logical” mindset. They may feel that everyone is against them or that nobody truly supports them. It’s important for loved ones to give them space, but to also use acts of service to prove that they care. When they are ready to talk, they need someone who can let them vent without judging them or trying to rationalize their feelings. You can find out more about this stage and get tips for overcoming it here. When ENFJs experience grief, they can have a difficult time showing their true feelings to the world. They usually feel pressure to maintain a calm presence around people, especially others who are suffering. They may initially repress their emotions in order to tend to others who are grieving or in order to “fix” things that need fixing. Eventually their own emotions bubble up to the surface and they find themselves seeking support. They are usually good at empathizing with other people who are grieving as well as finding support when they are ready to talk. It’s important for them not to take on the role of “supporter” too heavily and never get around to processing their own emotions. Many ENFJs report that exercising while they process their thoughts and emotions is helpful. If despair or stress is chronic, ENFJs may fall into an uncharacteristically critical stage. They may appear more harsh, critical, and exacting than usual and may withdraw from people. They can get stuck analyzing what happened and finding ways to blame themselves for what went wrong. To find ways to help them in this phase, click here. When INTPs experience grief they usually avoid showing it for a very long time. They will draw inward, seek privacy, and look inside themselves to discover went wrong. They are prone to self-blame so it’s important for them to take time to look outside and realize the problem (or whatever happened) is much bigger than they could have controlled. They tend to feel increasing turmoil the more they suppress their emotions; but they persist in hiding them. Many INTPs report that they feel awkward asking for help or expressing how they feel. They may try to apply logic to the situation or “cut loose” and move on. While this isn’t always bad, it can cause their suppressed emotions to stay in the shadows only to “bubble up” later. If they don’t deal with their emotions or find support they may suddenly reach a breaking point and become uncharacteristically emotional and angry. They tend to withdraw when they are in these phases because they feel out of control and unsure of themselves. You can find out more about this stage, and how to help someone experiencing it here. When INFPs experience grief they will draw inward and want some time alone and privacy to sort through their emotions. Like all introverts, INFPs are prone to looking inward and blaming themselves first. It’s important for others to realize this and re-affirm that whatever happened was not their fault. Some INFPs are helped by writing down their emotions, others just need to soak in them for a while and allow them to come and go on their own. After some time alone, most INFPs will find a trusted friend or family member to talk to. They’ll want support, affirmation, and empathy during this time. They are also good at providing support to others who are struggling and grieving. Many INFPs report that talking to a counselor helps them. If INFPs don’t deal with their emotions or find someone to talk to, they may let the stress and despair build up to a breaking point. When this happens they can become uncharacteristically harsh and critical with others. They may become sarcastic, cynical, and focused on righting wrongs. They may also become obsessed with organizing things or analyzing the situation logically. You can find out more about this stage, and how to help someone experiencing it here. ENTPs experiencing grief tend to initially conceal their feelings and put on a calm face around others. They often try to apply logic to the situation, but then feel resentful of their own logic when it fails to dissuade their sorrow. They usually need time alone and privacy to sort through what’s happening. They tend to rush the grieving process as quickly as possible – often too quickly. This can cause repressed emotions to “bubble up” to the surface unexpectedly at a later date. They may find themselves crying but have no idea why, or they may find themselves becoming more edgy and easily angered than before. It’s important for friends to let them know that they are there if they want to talk, and to be aware that what is happening is very likely a result of unprocessed grief. If ENTPs don’t find a means to deal with their grief or they experience ongoing stress, they may go through a phase of being uncharacteristically focused on details. They may feel that they have to tie up a bunch of loose ends, or they may develop “tunnel vision” and focus solely on nitty-gritty details and facts. They can also develop symptoms of hypochondria and worry about illnesses. You can find out more about this stage and how to help here. 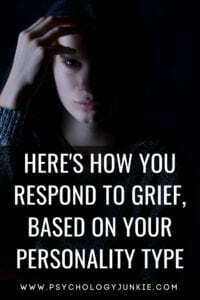 ENFPs tend to have one of two reactions to grief. Some ENFPs will want to just get away from everyone and everything and go somewhere new to process their feelings. Others will seek out the comfort and support of people they trust. They will not usually open up to people who aren’t especially close to them. They will try to understand the meaning of what happened. If there was a death involved, they may consider things like the afterlife, the meaning of life, how short life is, and other big-picture questions. While they seek support they will also want to give it to others who are grieving. They are good at listening to others and providing empathy and assistance. It’s important, however, that they not get stuck in the role of “supporter” for too long and forget to take care of their own needs. It’s also important that they give themselves time to process the emotions privately. If ENFPs don’t find a means to deal with their grief, or if despair or stress is ongoing, they may go through a “grip stress” phase. When this happens, they become uncharacteristically focused on details and tying up loose ends. They can develop “tunnel vision” and obsess over a project that needs to be finished. Some ENFPs develop physical symptoms and, when in a stress phase, can worry that their symptoms are the sign of a serious, life-threatening illness. You can find out more about this phase, and how to help, here. Was this helpful? Is there anything you would add? Let us know in the comments! Certainly true for me. I’m an ENFP. My description was super accurate. Thank you for posting this, Susan. I like to know how everyone processes grief. Thank you for reading and giving me your feedback!